Tim Mullooly: Welcome back to Living With Money. This is Tim Mullooly. On today’s episode, I’m joined by Christine Benz. 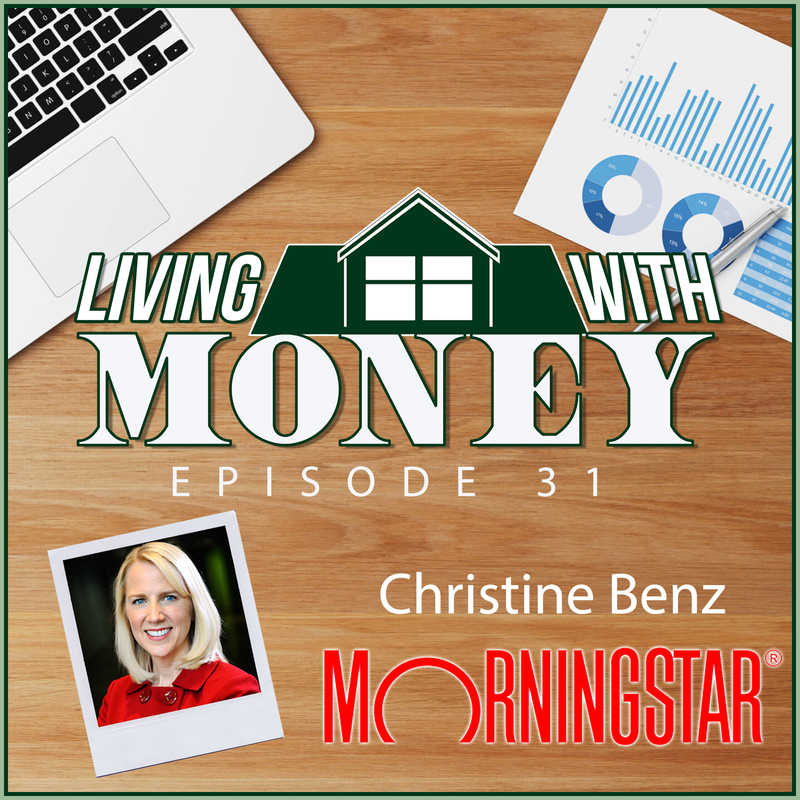 Christine is the Director of Personal Finance at MorningStar as well as the author of a handful of books which we’ll talk about later in the episode. I’m very excited to have Christine on to talk about all things personal finance related. So with that, Christine, thank you for coming on the podcast. Christine Benz: It’s my pleasure. Thanks for having me. Tim Mullooly: For the listeners out there, can you give a brief background about yourself and how you got to where you are in your career today? Christine Benz: Sure, it’s been a circuitous journey. I was actually a Russian Language and Political Science major in college, so my background had absolutely nothing to do with what I do today. But MorningStar was kind enough to hire me as a copy editor back in the early 1990s. I was editing the analyst reports. And I should say that my dad was always an investor and had always talked to me about investing and given me some thoughts on investing. He was actually the one who put me on to MorningStar not so long after I graduated from college. And so he had indicated that he was using MorningStar to do his research. He was kind of an early mutual fund investor. I started … After being a copy editor for a couple of years, I started in our analyst career path in our analyst group and eventually headed up our fund analyst group. But along the way, I got more interested in matters of personal finance. In portfolio planning, in asset allocation, and topics that we couldn’t readily talk about in the context of our jobs as individual security analysts. So I went through the CFP program and felt like I got a good kind of basic download of a lot of different personal finance information. And then MorningStar kind of let me segue my career in that direction. I’ve always loved the individual investor group. The individual investor market. And so I focused primarily on that segment through morningstar.com where I write articles and do videos. And a particular focus for me over the past say five or seven years has been retirement planning and decumulation. Because in speaking to investors, and I do do a fair amount of public speaking, it became clear to me that people needed help with the decumulation phase. So the logistics of decumulating a portfolio in an era in which yields are really low. That is something I’ve been toiling on for the past several years. This idea of how do you decumulate a portfolio. Tim Mullooly: Through talking to other advisors as well, I found that that is something that other advisors are struggling to deal with clients in the decumulation phase like you’re saying. Christine Benz: Yeah. It’s a huge challenge. And actually it was driven home to me in talking to my late father in law about his portfolio management. He would come to me and say, “Oh, Christine, I bought this GM Preferred stock that has the yield I’m looking for.” And I think, “Gosh, I don’t know a lot about GM’s finances, but I don’t love the sound of that.” But he was one of those very income centric investor. He wanted to subsist on whatever yield his portfolio created. And as you know, that introduces risks into portfolios oftentimes. When someone is gravitating to a certain security type strictly because of its yields. So I wanted to work on that problem. If yields were not high enough to support someone’s desired standard of living, how do they go about extracting cash flow from that portfolio. So that’s something I talk a lot about in my work. Tim Mullooly: And I’m sure as director of personal finance, you’ve probably seen it all in terms of personal finance mistakes and blunders that people make. If you had to sit on just one or two, what would you say are some of the most common personal finance mistakes that you find people make? Christine Benz: Well, a couple. I think one of the big ones and this is a really sort of generic comment, but we do see that people are under saved. I mean, when you look at the retirement crisis in this country, a lot of it does have to do with the fact that we’ve moved to this environment where people are increasingly thrust into doing heavy lifting of their retirement savings and they’re simply not saving enough. So that’s kind of a boring blunder but it’s certainly one of the ones that is the route of a lot of people’s problems. Performance chasing is another sort of evergreen issue where investors have this inclination to believe that performance in a given fund or stock or whatever it might be will be somehow predictive and that just isn’t the case. So those are a couple of the big ones. Tim Mullooly: I would have to agree. That’s two of the more common ones that we see here for people who just aren’t saving enough would seem like the common way to avoid that would just be to try and save more money. But are there any ways that you’ve found that work better for people in terms of trying to save more money or different habits that people have established that help them save more money? Christine Benz: Well, I think putting things on autopilot is such a great strategy. Similar to what we all do with our company retirement plans where you’re steering a portion of each paycheck directly into your savings, I think that’s a really powerful tool and people should venture beyond their company retirement plans in terms of trying to automate as many of those contributions as they can. I think that’s one of the best ways to go about it. Another thing that people can think about is just managing any ongoing expenses. Sort of trying to combat those ongoing expenses to the extent that they possibly can. So anything that’s subscription based. Thinking hard about do I really need this subscription because when you total up those monthly outlays, even though they might seem fairly innocuous, they add up some significant money. So just making sure that you’re being very choosy about which of those monthly sort of programs you sign on for. Another thing I think people can try to stay mindful of is lifestyle creep. So that natural tendency that we all have as we begin earning more money, to just start expecting everything to be better around us. And soon enough, you’ve got someone who cleans your house, and someone who walks your dog, and someone who mows your lawn, and all of those things. Even though you feel that you need them to really make sure that you are using your resources wisely as you begin to make more money. Tim Mullooly: And I think just staying mindful of having all of those things is almost half the battle for some people. I was talking to a friend recently who was looking through their finances and they realized through all the subscriptions like what you were talking about kind of with Netflix and music and stuff like that. They realized they’re spending over $200 a month on different subscriptions. And that was one of the biggest ticket items in their budget per month. You think just staying mindful of the fact that these subscriptions are there is an easy way for people to try and keep it under control? Christine Benz: I think so. And I think auditing which of them you’re using, right? I think Netflix is a great example. And what I think is part of the reason why they have such a great business model, their per month price is something that none of us really worry too much about. It’s like the equivalent of a drink in a bar. In a good bar. It’s whatever it is, 12, $14, or something like that. And so it’s easy to just be like, “Well, even if I’m not watching anything on Netflix currently, it’s so small. Why should I worry about it?” But then you multiply that across a few services, and it starts to be some serious money. Tim Mullooly: In terms of performance chasing, how is one way to try and combat that? Is there any … Is it mostly behavioral or maybe working with someone to try and keep you in line? Christine Benz: I think either. I think if people are individual investors, understanding the role that some of these behavioral tendencies can play in the way that they manage their money. I think that that is a way to think about it. Another thing is, as you said, if someone is working with some sort of a financial advisor who can help combat those tendencies. Although to be honest, I think some financial advisors sometimes cave to performance chasing as well. That’s not the exclusive domain of individual investors. I think it’s simply sort of an educational challenge because people don’t understand that past performance isn’t particularly predictive. We try to educate around that issue certainly in our work here at MorningStar. We talk about fees as being among the most predictive factors whereas performance actually isn’t super predictive. Tim Mullooly: You know what you’re going to pay the person, but you don’t necessarily know … What you’re going to pay for a fund, but you don’t necessarily know what it’s going to return to you. Tim Mullooly: So it’s kind of a variable versus a controlled, fixed amount. Tim Mullooly: You’ve written a handful of books over the years. A lot of them have had to deal with mutual funds. Individual investors sometimes don’t necessarily understand all the ins and outs of mutual funds. What would you say are some of the common misconceptions that you’ve come across while talking to people about mutual funds? Christine Benz: Well, we just talked about one of the big ones which is that whole performance chasing thing. That idea that past performance is predictive. Another one that kind of goes hand in hand with that idea is this manager is worth it. Is worth 175 basis points or whatever it might be. That investors sometimes think well not only is this fund’s good performance going to compete into the future, but also this fund manager will be able to overcome the headwind of these high costs that he or she might be saddled with. And so those area a couple of big misconceptions that can really hurt investors. The good news is that increasingly we’re seeing investors gravitate toward very low cost products. Our fund flow data for the past several years have shown loud and clear that investors are preferring index products whether traditional index funds or ETF’s at the expense of more expensive active funds. Tim Mullooly: In terms of like you were saying with the managers for each fund, is there a way that investors can sort of do their due diligence or research on different managers and try and align themselves with maybe someone who has the same type of goals or management style in terms of selecting different investments for their funds? Christine Benz: Yeah. And certainly, I’m biased, but I think we’ve got a lot of great resources on morningstar.com. Not just data, but also our analyst reports and our analyst rating can help investors select what I think are the better … To the extent that they want to have actively managed funds in their portfolio, I think we’ve got some good tools and resources for pointing investors to those funds. But I do think you raise a great point about understanding the strategy. Make sure that you fundamentally understand it and that you’re aligned with it. That if it’s say a growth strategy, make sure that you understand the specifics of that strategy. And make sure that you understand the periods when a fund will inevitably underperform the market and perhaps underperform its peers. Because that’s crucial to having a good experience with funds is understanding the strategy and sort of having some expectation about why a fund is behaving as it is. Tim Mullooly: Right. And I feel like that applies … Regardless of the style or strategy involved, I feel like for investors to just understand that whatever fund you’re invested in, eventually it will underperform the market or something. Just understanding that concept alone is crucial for people to be able to stick with their investments. Because if there was a fund that never underperformed, everybody would own it right? Christine Benz: Or it’s Madoff. Christine Benz: But no, it’s crucial. And the other thing is at all times, you should be having something or a couple of things in your portfolio that is not doing so well. And that’s diversification right? I mean, that is what you want to see is the holding or two that is absolutely painful to own. So right now it’s probably value stocks for a lot of us and it’ll ebb and flow. There will be points in time where growth stocks will look terrible and value stocks will look relatively good. You have to have those positions in your portfolio that at points in time are painful to own and those are what give you the diversification. Tim Mullooly: Totally agree. Back in 2009, you put out a book that was titled 30 Minute Money Solutions. Can you talk just a little bit about what readers can learn in that book? So the book is styled as kind of a here, do this kind of book where it will get you to a semi-reasonable answer in a short period of time. It’ll help you just check that job off your list. So that was the goal and that’s kind of the organizational system of the book that it’s just structured task by task and talks you through from start to finish how to get that task done. Tim Mullooly: That’s great. That’s a pretty useful tool and like you’re saying, a lot of people are sometimes crunched for time. So the fact that they’re in little tidbits is definitely more useful for the person who doesn’t have hours to sit down and research all of these different topics. But this book coming out in 2009, what was it like writing about personal finance topics during or right after what happened in 2008, 2007, and the beginning of 2009 for some people? Did you find it more important to get a book like that out as soon as possible for people to kind of get … Try and get their finances back on track if they were hurt by the recession and the market decline? Christine Benz: Yeah, it’s interesting because at the time when I was working on it, the market was beginning to recover but you’re never quite sure is this the start of something lasting or is it just maybe a head fake or something like that. When I was working on the book intently in the summer of 2009, we weren’t quite sure and we had talked about addressing the financial crisis more specifically with the title of the book. Making it kind of a market recovery sort of book. And I’m glad that we decided not to be so anchored. For one thing, the book would not be so evergreen had we gone that route. But also, I think it just would have made it a little narrower than it is. We toyed with making it more specific to how to recover any losses you’ve had, but stepped back from making it so time period specific. But definitely it was an interesting time to be working on something like this. Lessons of the financial crisis were fresh, which was good. We were able to talk about important topics like diversification and making sure you’re not taking too much risk if you have a goal that’s very close at hand. Which was something a lot of people approaching retirement during that period experienced or even people saving for college for their kids. Many of them found that their portfolios were too aggressively positioned. So we were able to stitch in some of those lessons of the financial crisis. But it’s really not a book that hinges specifically on financial crisis. Tim Mullooly: I agree with what you said that it was a good idea to not really anchor right on that time period because some of the lessons that people learned during the financial crisis and during that time still apply today. It’s not like it was just specific to that time period. So the lessons can be taken and directly applied to what happened in 2008. But it can also be applied to people’s situations today in 2018. Christine Benz: That’s right. And frankly, I think it’s interesting how short people’s memories are about the financial crisis. I encounter an awful lot of complacency about equity market risk. Even among people who were investing during that time period. People who are older, people who are getting close to retirement. I think there’s the sense that it’ll never be that bad again or maybe they’d just forgotten how bad it was. But meanwhile, we’re all almost 10 years older and I think it’s really important to recall how that felt and how scary that was for a lot of investors and for some investors who were too aggressively positioned. And if they’re getting close to decumulation, it meaningfully affected their standard of living. Tim Mullooly: Yeah, it’s definitely important to take those lessons with you and not forget what happened. Kind of segueing nicely into my next question which was going to be about one of the articles that you wrote earlier this year titled, Lessons From the Past 25 Years. Outlining some of the most important lessons that you’ve learned over your career. One of them that resonated with me heavily was there was a quote that said, “Investing is the attention hog in many discussions about how to reach financial goals.” Can you explain a little bit what you meant to that to our listeners? Christine Benz: Yeah, I think a lot of investors latch on … Or people latch on to the idea of their portfolio and their investment selections doing the heavy lifting in terms of whether or not they reach their goals. And unfortunately, I think the reality is that financial success is much more mundane. It’s much more about savings, healthy financial habits, and less about savvy investment choices. One experience that was really stark for me was a year or so ago, I was talking to a friend who had told me that he was working with a financial advisor who basically said, “Well, you don’t have enough small caps in this portfolio,” and was kind of looking specifically at what the portfolio issues were. He said, “Can you help me? I feel like I’ve got some kind of a portfolio emergency here where my portfolio isn’t properly allocated.” So I sat down and we looked at some of the holding, looked at the total asset allocation, and then we had a broader discussion about how much are you saving a year? How much do you have saved so far? It became quite clear to me that it really wasn’t a portfolio emergency. While he could have maybe used a little bit more small cap exposure in his portfolio, it was really more of a savings problem. He was under saved relative to where he should be given his proximity to retirement. So people don’t necessarily want to hear that message because that requires them to tighten their belts and might translate into some unpleasant repercussions for their standard of living. But oftentimes, I think people disproportionately focus on the investment piece being able to heal all of the problems that someone’s financial plan might have. Tim Mullooly: Right. Yeah, it’s easier for them to want to depend on the investments to make up for their lack of savings. Tim Mullooly: But like you’re saying in the beginning, one of the most common mistakes that you talked about was people don’t save enough money and you said that that’s boring. And I agree. It is boring, but it’s so important. So even though it’s not the flashy, exciting thing watching your investments go up every day or up and down, saving is definitely the more important although boring piece of that puzzle. Christine Benz: For sure. And it’s also the most impactful thing you can do to take control if the market goes down. If you can find a way to step up your savings rates during those periods, that’s a real way to take back control in an uncertain market environment. Tim Mullooly: Right. Yeah, it’s kind of like what we were talking about before with fixed controllable things versus variable. You don’t really know what the market’s going to give you, but you know how much you can save each month. Another one of the lessons from that article was about how less is so much more. Can you talk a little bit about what you meant by that? Christine Benz: Yeah, I think many people kind of go through their lives … Especially as more and more of us change jobs more frequently, we’ve got kind of these investment collectors. People who end up with lots of different investments in their portfolio and lots of different accounts here and there. Whether old 401k’s or little IRA’s that they rolled over from former employers. And so they end up with a lot of clutter in their portfolios. Maybe within those portfolios, niche holdings, whether emerging markets funds, or sector specific funds, or whatever it might be. So people end up with many more moving parts than they need in my view. And I like the idea of streamlining and I think it can be particularly effective for people who are getting close to retirement to try to really skinny down the moving parts in their portfolio. Index funds I think can be a great option in that instance in terms of giving you a lot of market exposure in a very low cost package. And I also like the idea of consolidating account types to the extent that you possibly can. So you can really keep tabs on what your asset allocation is, how much you have. It’s much cleaner than having a lot of little onesies in five, or six, or 10 different silos. Tim Mullooly: Right. Yeah, it’s definitely better to keep things simple. Both in terms of investments and a number of accounts. Just keep things in one place, keep it nice and tidy, and you’ll be better off. One article that you wrote very recently was about hindsight bias and if it could be inherited from parents or quote unquote “family money lessons”. You were talking about an interaction that you had on Twitter with Bill Sweet from Ritholtz Wealth Management. For those who might have missed that article, do you want to talk about the interaction and the realization that you came to after talking with Bill about cars? Christine Benz: Yeah. It was eye opening and I will be the first to say I’m not a car expert. In fact, my husband was laughing. He was like, “You were talking about cars on Twitter? What?” But we were talking about how buying … Bill had said he always buys a two year old car because you can find some inefficiencies. Like people need to dump a good car that doesn’t have many miles on it and you can get them at good prices. And I was like, “I’ve never had a used car. We never had used cars in my family.” And so I was thinking how could that … He knows what he’s talking about but I realized that I had been saddled with this sort of notion that in hind sight was maybe left over from my parents’ experience in the 1970’s when American cars were not especially good. They have a lot of quality problems. That’s when a lot of US auto owners switched over to owning imported vehicles. And my parents always bought new cars. And so that was sort of the way that we did it in my family. And it was a clarifying moment for me because it made me realize whether some of these sort of bits of received wisdom that we’re carrying around are based on situations that maybe will not repeat themselves again anytime soon. So US cars I think by all accounts are much better made than they were a few decades ago. And maybe buying used car is a perfectly safe and reasonable thing to do. And so it made me just want to kind of take stock of all these things that I had learned from my parents who were financially well, financially healthy people who I think imparted a lot of good lessons to me. But it made me kind of want to pick apart, well, they always said you should buy a house as soon as you possibly can and you should buy as much house as you possibly can. And so I kind of went through the family money lessons one by one just to see, well, how much of them might have been dependent on a specific time period that my parents experienced that may or may not repeat itself during my lifetime. Tim Mullooly: Right. I feel like that’s … We learn so much from our parents and the older generations that sometimes you just assume that what they told you is correct because for me, a lot of what my parents told me was correct. But it’s interesting that you have to stop and think maybe was that just specific to their situation and maybe is it going to be a little bit different for me? Christine Benz: Right. Exactly. In fact, that was another thing I was looking at. My dad was always an avid equity investor and just a believer in equities and had good risk tolerance. So he was always just sort of like why would you buy bonds and thinking about that and he had told me specifically that the experience of the 70s where there was runaway inflation and spiking bond yields, that was what sort of turned him off of bond permanently. And whether that was a good strategy for him to carry into his 80s. To have a mostly equity portfolio. I’m not so sure. Because it stressed him out probably a little bit more than it needed to having a very volatile portfolio. So I think it is worthwhile to check up on not just our own experiences and how they might be influenced by hindsight bias but also think about well if you learn this stuff from someone else, what influenced the advice that they’re giving you and what specific life experience might have influenced the advice. Tim Mullooly: Right. Totally agree with that. Another one of your posts that you wrote recently was asking investors if their portfolio was quote unquote all weather. What are some ways that you think investors can weather proof their portfolio? Christine Benz: Yeah, I think it’s worthwhile to think through some of the major risks that can confront portfolios over time. Many investors certainly today are keenly attuned to the prospect of interest rate risk and how that might affect not just their fixed income portfolios but also portions of their equity portfolios. So that’s one. Inflation risk I think is another one that ought to be top of mind for investors where we have begun seeing inflation tick up a little bit. And that’s a particular concern for pre-retirees and retirees who aren’t getting cost of living adjustments through their pay check who are drawing down from their portfolios. I think for them, making sure that their portfolio does include some inflation protection either in the form of inflation protected bonds and/or in the form of equity exposure in the portfolio. Another one that I think we would be remiss not to be thinking about is some sort of an economic downturn even though most of the economic signals we see are quite positive, I think it’s still worth thinking about or what sort of economic sensitivity is embedded in my portfolio and in my specific holdings. And do I have things that could potentially protect me from such an environment. So high quality bonds, for example, would tend to do well in such an environment. So think of the basic ideas. Doing that basic diversification check while thinking through the specific risks that could arise in the next decade or even over longer time periods. Tim Mullooly: Like we said, the markets are going to ebb and flow. You said, the economic indicators right now are still pretty positive, but eventually, that’s going to change. So I think constantly auditing your portfolio and making sure that whenever that happens … Because no one has a crystal ball. You’re not going to know when it’s going to happen. You need to just have those weatherproof items in your portfolio before it happens. Christine Benz: Absolutely. And I guess one point I would make is the 60-40 portfolio 10 years ago would be over 80% equity today. So even investors who haven’t been actively adding to equities in their portfolio have more equities in their portfolio because of the strength of the market. So I think just doing that basic asset allocation audit, not being complacent about what has worked for you in the recent past, don’t extrapolate that going forward. Tim Mullooly: Right. Exactly. Like I said before, a lot of the books that you have written have touched on mutual funds and different aspects of mutual funds. What do you make of the growing trend of ETF’s, exchange traded funds, in the industry and do you ever foresee a day in the near or far future where mutual funds are not necessarily useful anymore? Christine Benz: It’s a good question. Generally I have applauded the growth of ETF’s in that the net effect of it is that it has driven costs down throughout the industry which is a good thing for investors. It’s affected fees on actively managed funds, it’s affected fees on traditional index funds. So those are positive developments. I do think that perhaps ETF’s value has been overstated in the context of retirement accounts. So I think with ETF’s versus index funds in some sort of a tax sheltered wrapper, I see the two as kind of fungible, I don’t think there’s any particular magic to the ETF. It seems to me that the real benefit of the ETF versus the traditional index fund comes in the realm of the taxable account. So I think perhaps some investors might be overdoing their enthusiasm in the realm of ETF’s in retirements accounts. And we really haven’t seen ETF’s make any meaningful asset growth in the realm of company retirement plans, but I think more and more advisors are putting client IRA’s in ETF’s. And I’m not sure I see the huge advantage versus traditional index funds unless there happens to be a cost advantage. As far as the active versus index question, it’s certainly something that we at MorningStar monitor on an ongoing basis where we look at the batting average of active funds versus ETF’s and index funds. And certainly the typical active manager doesn’t make a great case for him or herself on average. But I would say that doesn’t mean that you can’t identify active managers who will outperform. We happen to think that we have skills in that area of being able to help direct investors to the better performing active funds. And interestingly enough, we think that that low cost subset of active funds is really the place where investors should look. If they’re looking at active funds, they should focus on that very low cost route. As far as mutual funds no longer being useful, I still think there are some categories where a mutual fund is a better idea than an ETF. One notable area would be in the area of corporate credit. High yield bonds, for example, if I were to talk to my colleagues who focus on ETF’s. Even they would say that an actively managed fund probably makes sense in those areas. That would be one area. And there are a few others. But the jury isn’t out on fixed income management in general that you’re better off using an index product versus using an active fund. Although that may be because the typical active manager overweights corporate bonds at the expense of government bonds relative to the indexes. Tim Mullooly: The point that you were making about ETF’s and mutual funds within retirement accounts I think is spot on. There isn’t really too much advantage for ETF’s there within the retirement accounts. Christine Benz: Yeah, I was talking to Roger Wohlner who is a financial planner here in the Chicago area and he helped ETF’s and 401k’s. A solution in search of a problem. And I think that’s a pretty good way to describe it. It’s hard to see the point. Tim Mullooly: Over the span of your career … It might be a tough question to answer, but what would you say is the best piece of advice that you’ve ever gotten? Christine Benz: Do you mean in the realm of career specifically or in the realm of investing? Tim Mullooly: If you have one for both, I’d love to hear one for both. Christine Benz: I think that for me, kind of a guide in terms of career, a guiding focus for me has been to try to do something that feels somewhat altruistic. My parents very much encouraged me to pursue a career in that direction. I was pretty amorphous about it when I was in college, but I’m glad that I kept that as a focus and I’m really grateful that I’m able to do that. I think in my day to day job to try to lend some clarity to this whole retirement planning space. So I guess that’s the best piece of advice that I received early on I think from my parents just to … If that’s what I want to do, then I should make that a focus. And that’s worked out for me really well in terms of just my satisfaction with my job and my sense that I’m doing something that maybe makes a little bit of a difference. And then in terms of investment advice, I guess, going back to my dad, I was very influenced by my dad being a stock investor, being a believer in stocks. And also just in being incredibly able to live with the fluctuations that accompany the stock market. I remember it was just always a part of our conversation at home that the market would go up, and down, and sideways. And yet my dad was always kind of a believer in maintaining ample equity exposure. And so I have been glad that I’ve always just kind of taken the equity market fluctuations in stride or I had been able to do that easily because that’s what I learned from him. But now that I’m getting older, it could be getting a little harder. But so far so good on that front. Probably maybe more equity exposure than experts might advise given my age. But I’m comfortable at the fluctuation. Tim Mullooly: Well, in both cases, those are good pieces of advice to give to someone. And for investors out there, if you can be comfortable with the market fluctuations, you’re going to have most likely more success than someone who is uncomfortable with it. So on the flip side of that, would those be the pieces of advice that you could give to someone just starting their career or just starting investing today? Or are there other pieces of advice that you would give someone just starting out? Christine Benz: I love the work that some of my colleagues here at MorningStar have done on the topic of human capital and investing in human … Investing in your own human capital. So I think that for someone just starting out, recognizing the importance of nourishing that human capital whether through further education or maybe it’s just pursuing some training or some designations that can help embellish your earnings power during your career, I think that that’s a terrific piece of advice. And especially to make those human capital investments as early as you possibly can. Once you figure out directionally where you want to go to make those investments in extra education before you get encumbered with a family and other obligations. Things that might distract you from being able to enhance your human capital. So I think that that is a biggie. Tim Mullooly: Definitely. I agree with that. Christine, that was all the questions that I had for you today. I want to thank you again for coming on the podcast. It’s been a pleasure. Christine Benz: Tim, thank you so much. It’s been my pleasure. Tim Mullooly: So for the listeners out there, I’m going to link in the show notes to some of the blog posts that we talked about from Christine as well as the books that we touched on as well. That’s going to do it for this episode of Living With Money. Thanks for listening and we’ll see you on the next one.